Operational risk in conventional banking is relatively easy to define, identify and measure. Trying to undertake a similar exercise within an Islamic financial institution is significantly more challenging. Heightened documentation risk – the risk of the wrong documentation being used, or being misused, or applied incorrectly is a significant risk for an Islamic bank, and one that regulators are taking notice of. Through the very nature of their structure, composition, philosophy and business activities – the avoidance of uncertainty and the adherence to risk-sharing principles – exposure to legal risk is very real for Islamic financial institutions, including that of cross-border legal risk. 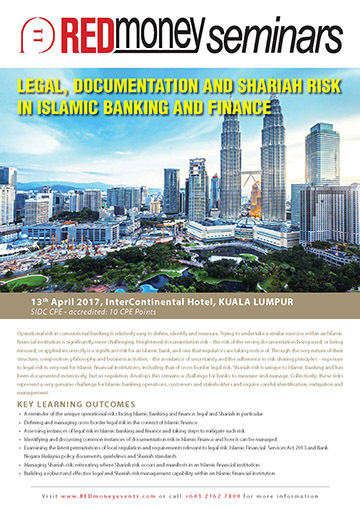 Shariah risk is unique to Islamic banking and has been documented extensively, but as regulation develops this remains a challenge for banks to measure and manage. Collectively, these risks represent a very genuine challenge for Islamic banking operations, customers and stakeholders and require careful identification, mitigation and management. The seminar will be highly beneficial to anyone in a bank or financial institution involved in the structuring, development, marketing and risk management of Islamic financial products, and in particular, functions such as legal, compliance and audit. What is and where does legal and documentation risk occur considering the products and activities local banks are involved with?